Mountain meadows and riparian areas across the western United States constitute a unique and critical natural resource. On California's national forest lands, mountain meadows and their broader forested landscape provide a multitude of ecosystem services, including flood water attenuation, diverse and productive forage for cattle and wildlife, and outdoor recreation for over 26 million people. 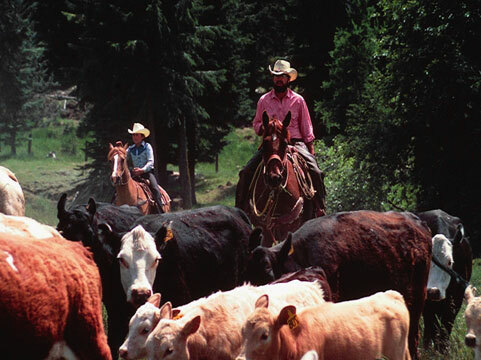 In response to concerns about grazing, meadow conditions, and threatened and endangered species, annual livestock use standards and guidelines for riparian areas were developed and incorporated into US Forest Service grazing allotment permits during the 1990s. There was, and remains, substantial debate over the adequacy and efficacy of these standards and guidelines to balance riparian conservation and livestock production goals. 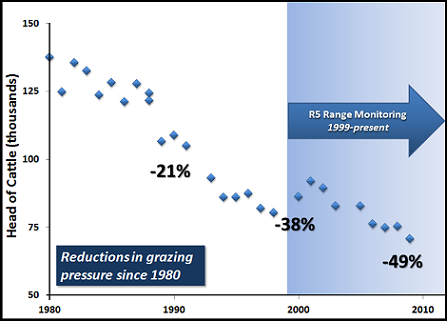 Trend in head of cattle on US Forest Service grazing allotments from 1980 through 2010 grazing. Reductions in number of head relative to 1980 numbers were 21, 38, and 49% in 1990, 2000, and 2010, respectively. The Region 5 long term meadow condition and trend monitoring program was initiated in 1998. Illustration of the design and example of the placement of permanent sample plots installed in meadows within USFS Region 5 grazing allotments. In 1999, the US Forest Service Region 5 Range Program initiated a region-wide, long-term meadow condition and trend monitoring program to document baseline meadow conditions as these new riparian standards and guidelines were coming into use; and examine long-term trends in meadow condition following implementation of these riparian standards and guidelines. relationships between meadow conditions and trends, livestock management, weather and environmental drivers. Across USFS Region 5 grazing allotments, key areas—meadows preferentially grazed by cattle due to high forage quantity and quality and drinking water availability—were identified for enrollment into the monitoring program. At each enrolled meadow, one to three sample plots were selected in a stratified random approach to obtain sites representative of the larger meadow vegetation complex. Each permanently marked plot consisted of three 25 m parallel transects, established five m apart. Along each transect, twenty 0.01 m2 quadrats were established at 1.0 m intervals. 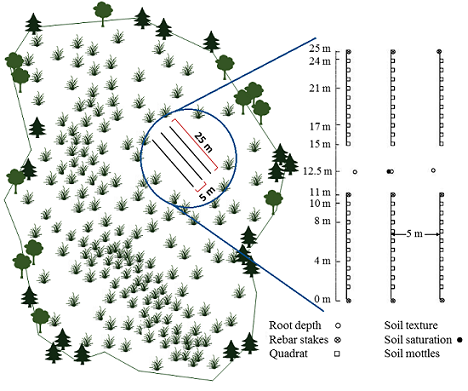 Frequency of all plant species rooted within each 0.01 m2 quadrat was recorded. Rooting depth and depth to saturation are also recorded within the 10-15 m positions of each transect. Following initial establishment and baseline readings, sites are re-read at approximately 5 year intervals by USFS project teams. 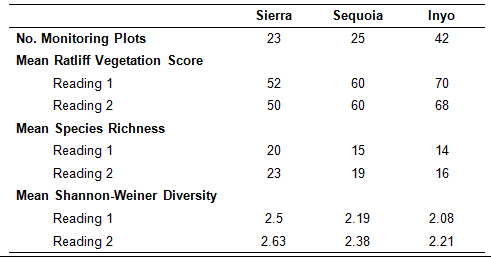 We found a significant increase in mean species richness and Shannon-Weiner Diversity from Reading 1 (made between 1997 and 2002) to Reading 2 (made between 2007 and 2012) on all three forests. There was no significant change in Ratliff condition class from Reading 1 to Reading 2. The interpretation of the Ratliff Vegetation Scores and Condition Classes is conducted by the Forest Service and is an ongoing process. For more information about these scores and classes, please see Ratliff 1985. US Forest Service Region 5 Range Program long-term meadow condition and trend monitoring sites and allotments. Related publication: Freitas, M., L.M. Roche*, D.W. Weixelman, K.W. Tate. 2014. Montane meadow plant community response to grazing. Environmental Management 54: 301-308. *Corresponding Author. Read more. 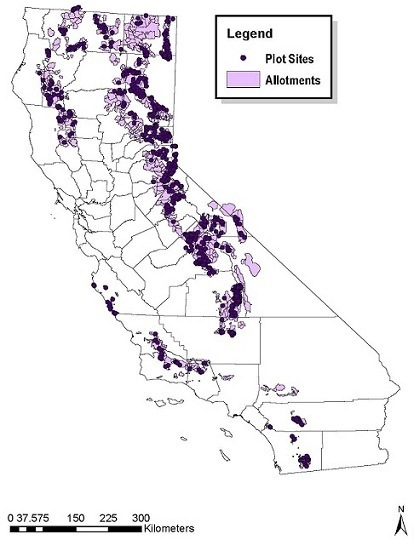 Livestock grazing on stream associated mountain meadows in California can negatively impact riparian vegetation, stream stability, water quality, and wildlife habitat. However, we have observed degradation at some grazed meadows but not others. This reflects differences in grazing management and meadow/stream resiliency to grazing. We conducted a cross-sectional survey of grazed riparian areas to identify and promote sustainable riparian grazing management. Identify grazing management activities associated with healthy mountain meadow streams. Extend these recommendations to grazing managers, regulators, and policy makers. Fifty-eight grazed meadow – stream riparian areas were enrolled in this cross-sectional survey. 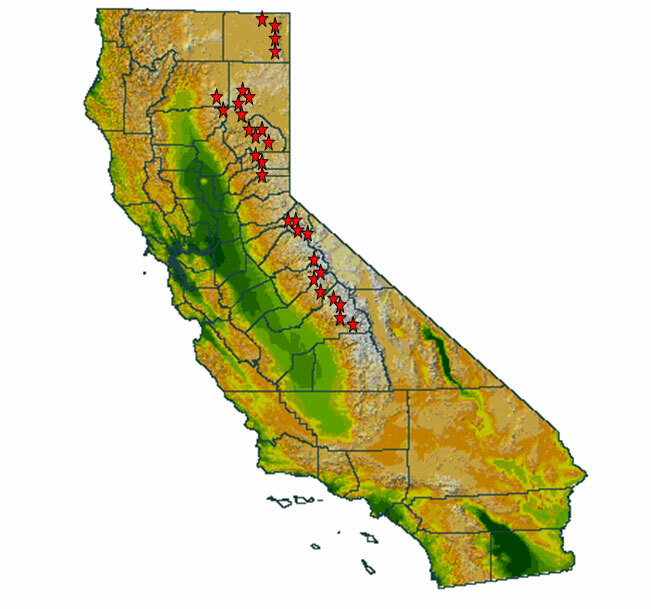 Sites were located on both public and private grazing lands across the Sierra Nevada Range, southern Cascade Range, and Modoc Plateau. A management survey was conducted with each grazing manager to quantify management activities at each site, such as number of head, class of livestock, season of use, time spent herding to distribute livestock, etc. A first approximation of riparian health was determined for each site using the U.S. EPA Habitat Assessment Field Data Sheet (HAFDS), which assigns a health score of 0 (very poor) to 20 (excellent) based upon an 11 panel site assessment. A direct measure of riparian health was made by collection and taxonomic ID of in-stream macroinvertebrate (insect) samples and calculation of indicators of stream health (e.g., richness, diversity, % sample composed of pollution intolerant taxa). Various site characteristics were measured, such as stream substrate type, solar radiation/canopy cover, channel width and depth, and streambank vegetative cover. Linear regression analysis was used to identify grazing management activities and site characteristics which were positively and negatively correlated with U.S. EPA HAFDS health score (0 to 20). Negative binomial regression analysis was used to identify grazing management activities which were positively and negatively correlated with 10 macroinvertebrate metrics sensitive to changes in stream conditions (e.g. water temperature, sedimentation). Independent variables were grazing management, and site characteristics. Increased effort to distribute livestock away from meadows and associated streams was correlated with increased macroinvertebrate richness. Management of livestock distribution is a critical management activity to enhance and sustain riparian health in mountain meadow grazing systems. Simple distribution tools such as herding, salting, and off-stream water are effective for protecting riparian areas, but management effort must be invested to assure success. Expectations for stream health based upon macroinvertebrate metrics must account for inherent site differences in stream substrate type.